We will then check our diary for availability and get back to you via email to confirm the date and go over the finer details. To finalise the booking we require from you a completed party booking form which will be sent via post or email (download here) and a small non refundable deposit. A confirmation email will be sent and your party entertainer will contact you on the week of the party to go through everything and answer any questions or concerns that you may have. All about the money.... Cheques and Transfers: the remaining balance should be paid no less than 14 days before the date of your event. If paying by Cash this should be paid directly to your entertainer on arrival. 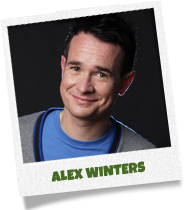 Originally from Cardiff in Wales Alex hosts Discover and Do and Bedtime Hour with co-presenter Cerrie Burnell.A football fanatic Alex is a regular on CBBC’s Match Of The Day Kickabout and a frequent contributor on CBeebies radio. Outside of television Alex comperes at a number of high profile children’s events and festivals. As a father and a husband Alex relishes his role as a children’s entertainer and has a great understanding of family dynamics. Fun, energetic and extremely likeable, Alex is a hit with children and parents alike. 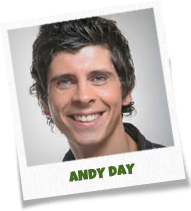 Andy has worked at CBeebies for the past 3 years hosting Get Set Go and Big Fun Time with co-presenter Sidney Sloane. Andy also presents Playtime, a weekly quarter-hour radio show for BBC Schools Radio and is currently host to his own show Andy's Wild Adventures. When not presenting for CBeebies, Andy stars in a comedy family show called Andy and Mikes Big Box of Bannanas which he co-wrote and co-devised with his long-term friend and comedy partner Mike James. Andy is young, fun and energetic. His charm and sense of humour make him a great choice of party host. Anna is best known for hosting Toonatikk on GMTV, ITV’s Daybreak, Jamie’s and Anna’s Big Weekend and hit show Camp Orange on Nickelodeon. Having started out at the Disney Channel Anna has gone on to work across numerous channels and programmes including Channel 5’s popular pre-school show, Milkshake and it’s teen strand, Shake, Scary Sleepover and Skillicious for ITV, and GMTV’s Toonattik. Anna is a keen supporter of charity and is an ambassador for both The Prince’s Trust and Child Line. Anna can currently be seen on Nickelodeon alongside co-presenter Jamie Rickers on their hit show Camp Orange. Instantly recognisable and extremely popular, Anna is a great choice of party host. Born in Kent and rasied in Sussex, Cerrie hosts Discover and Do and Bedtime Hour with herco-presenter Alex Winters. Cerrie is fast becoming a well respected and recognisable face. She was named in The Observer’s list of the top ten children’s presenters alongside veteran presenters including Valerie Singleton and Philip Schofield. 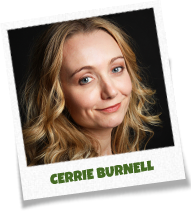 Cerrie also featured in The Guardian’s list of the 100 most inspirational women alongside the likes of Oprah Winfrey. Warm, engaging and naturally endearing, Cerrie is a popular choice of party host. Derek is a presenter on Channel 5’s hit children’s show Milkshake. Born in Dublin Derek began performing from a young age. At the age of sixteen he was signed by Warner Brothers as one of the members in boy band D-Side. With D-Side Derek enjoyed incredible success with three Top 10 singles in the UK and massive success throughout Europe and Japan including a number 1 album. Derek has performed on many TV shows including Top of the Pops, The Saturday Show, Ministry Of Mayhem TV and This Morning. He can currently be seen delighting audiences across the UK with Milkshake’s live spin off show Milkshake Live. A talented entertainer, Derek is sure to inject fun and excitement to any party. Emma Nowell is best known as a presenter on popular CiTV children’s show Hi-5. Aimed at children between the ages of two and six, “Hi-5” uses music, movement and laughter to make learning fun. Based in the North East of England, Emma is an extremely talented and versatile performer. She has starred in both the West End and UK Tour of Blood Brothers and featured in the BAFTA nominated film Rollin’ With The Nines. Emma’s infectious personality and bubbly demeanor make her a great choice of party host. 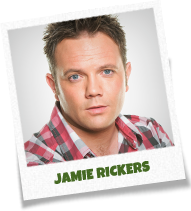 Jamie is best known as a presenter on GMTV’s number 1 weekend show Toonattik, CiTV’sProve It and The Yuk, Jamie’s and Anna’s Big Weekend and hit show Camp Orange on Nickleodeon. Having worked across numerous channels and programmes Jamie is one of the most well known and loved children’s television presenters around. Jamie can currently be seen on Nickleodeon along with with co-presenter Anna Williamson. For many children across the UK the weekends would not be the same without Jamie’s hi-jinks. Fun loving, upbeat and energetic, Jamie is the life and soul of any party. Jen is a presenter on Channel 5’s popular pre-school show Milkshake! and it’s teen strand Shake!. A natural performer from a young age, Jen always wanted to be children’s television presenter. Having graduated with a Media and Performance degree from Salford University Jen was snapped up by Milkshake! and began working as one of their main presenters. Jen can currently be seen delighting audiences across the UK with Milkshake’s live spin off show Milkshake Live along with co-presenter Derek Moran. Fun loving, upbeat and energetic, Jamie is the life and soul of any party. Young, entertaining and full of energy, Jen is a fantastic choice of party host. Kemi is a presenter on Channel 5’s popular pre-school show Milkshake! Kemi started off at Nickelodeon before landing her role on Milkshake! As well as presenting the live morning shows Kemi also hosts a number of programmes including the BAFTA nominated The Milkshake Show and A Milkshake Christmas, Animal Families and The Milkshake Bop Box. A talented musician Kemi writes a number of the songs for Milkshake! including the popular Milkshake! Rocks and The Breaky Bop. Kemi is currently preparing for the third series of The Milkshake Show and her own cookery show. Fun, lively and very entertaining Kemi will ensure your party is a success. Sorry but we just don’t think creepy clowns, stuffy puppet shows, bad jokes and dated magic are worthy choices for our favourite little people. BABYBOP offers party entertainment for children aged 2 – 10 years in London and surrounding areas. What happens? A 2 hour classic BABYBOP party starting at 15:00 will go a little something like this! 14:00 Behind the scenes: The BABYBOP mobile is crammed full of fresh as a daisy party kit and on it’s way to your venue. We aim to arrive no later than 30 minutes before the start of the party to introduce ourselves and to set everything up. 15:00 Party begins: Lights, check. Music, check. Time to get dressed! Children go wild in our fancy-dress boxes, we apply fake tattoo’s and face glitter until the majority of your guests have arrived. 15:20 Lets Dance: Party invitees will dance their socks off to one of our fabulous themed dance classes. Check out our favourites in the chart below. 16:00 Time for Food: Your party host will maintain the party vibe with cool tunes and is on standby to help with seating children, counting in the singing of ‘Happy Birthday’ and entertaining those that want to play. 16:30 Burn this disco out (and the sugar): Party games, Crazy dancing, Photo’s, Dance offs – we keep the children moving until home time. 17:00 I’ve had the time of my life: Children go home on a sugar free high! You breath a sigh of relief and wait for the complimentary emails to come rolling in. A Babybop party can be tailored especially for your child, so If you have a party idea/theme that is not mentioned on the site and would like to discuss it, then please contact us.